The World Health Organization (WHO) categorizes diseases that can be prevented by improving lifestyle habits as Non-Communicable Diseases (NCDs). NCDs, including cancer, diabetes, cardiovascular disease, and respiratory disease, are the leading cause of death worldwide . The habit of eating high-calorie low-nutrient meals such as those included in high carbohydrate diets and high-fat diets is thought to induce NCDs [2, 3]. These dietary habits seem to be related to masticatory function and health behavior, and the amount of tooth loss due to caries and periodontitis is related to masticatory performance [4, 5]. Impaired eating habits may also be caused by malocclusion due to various reasons such as skeletal deformity of the jaws, misshapen teeth, or temporomandibular joint disorder. Isola et al. , stated that up to 93% of patients with Juvenile Idiopathic Arthritis (JIA) may present with early inflammatory findings indicating temporomandibular joint disorder, and that their quality of life, including eating, smiling, oral hygiene, and daily activities, may deteriorate. The masticatory function of these patients decreases during the process of orthodontic treatment. Isola et al. also stated that biologically active substances such as inflammatory cytokines are expressed in response to the consecutive mechanical stress caused by the application of an orthodontic force. Thus, a prosthodontic treatment that restores masticatory function, as well as orthodontic and aesthetic treatments, should be promoted with consideration of the relationship with comprehensive metabolism and nutritional status. Tooth loss significantly impairs masticatory performance and causes the intake of sufficient nutrition difficult. Individuals with tooth loss frequently consume soft meals with high carbohydrate content (high-calorie, low-nutrient meals) . As they are easy to swallow, these types of food tend to induce fast eating, overeating, and postprandial hyperglycemia, which may trigger a deterioration of carbohydrate metabolism and metabolic syndrome [9, 10]. These individuals also tend to avoid vegetables and meat that require masticatory ability. As a result, they may develop Protein-Energy Malnutrition (PEM); this can happen even with sufficient calorie intake. PEM may lead to chronic hypoalbuminemia (3.4 mg/dl or less), sarcopenia (decrease of skeletal muscle mass), or a long-term decrease in bone mass . In the elderly, sarcopenia is a factor that contributes to the deterioration of an individual’s quality of life, eventually shortening his or her lifespan . It has been reported that improvement in NCDs is promoted by optimizing nutrition intake and preventing an increase in the Glycemic Load (GL) [13, 14]. However, when the masticatory performance of a patient with NCDs is low, it is difficult for him or her to consume adequate nutrition and become disease-free . Improving masticatory function through prosthodontic treatment seems to be the first step needed to improve the status of NCDs. Therefore, restoration of masticatory function through prosthodontic intervention seems to favorably affect the prevention of NCD onset and the deterioration of health. Meanwhile, even when the masticatory function is normal or has been restored through dental treatment, ideal eating habits cannot always be obtained ; this is because we use gustation to sort out food [16, 17]. Moreover, the reasons for tooth loss include patients’ inadequate eating habits and health behaviors. Therefore, it seems that behavior modification through health guidance, which should be carried out simultaneously with the recovery of masticatory function, is necessary for patients with masticatory dysfunction to acquire ideal dietary habits. The main goal of prosthodontics and orthodontics is aesthetic recovery and improvement in masticatory function . However, this goal must include primary prevention of NCDs through improvement in nutritional intake, body composition, and metabolism. This broad approach including a range of goals requires tailor-made health guidance for patients in addition to the restoration of masticatory function. The same intervention protocol was followed for all subjects (Fig. 1). The subjects’ masticatory function was measured before and after prosthodontic treatment. The subjects chewed a gummy jelly containing glucose for 20 s, then rinsed lightly with 10 ml of water. The concentration of glucose eluted from the gummy jelly in the water was measured with a glucose measuring device, the Gluco-Sensor GS-II (GC Corporation, Tokyo, Japan) . The average of the values measured three times on each subject’s deficient side was considered the level of masticatory ability, and Standard Deviation (SD) was calculated accordingly. Fig. (1). Protocol for prosthodontic treatment and health guidance. Table 1. Contents of the lifestyle questionnaire. Surveys on food intake and frequency per week were conducted using questionnaires on 29 food groups and 10 different cooking methods. From the results of the questionnaires, habitual nutrient intake per day was estimated and evaluated. Nutrients such as protein, vitamin B1, B6, C, folic acid, calcium, and zinc were evaluated for sufficiency rates against the adult general intake standard based on the Dietary Reference Intakes for Japanese (2015) by Ministry of Health, Labor and Welfare in Japan . Food Intake Frequency Survey FFQ Ver. 3.5 (Kenpakusha, Tokyo, Japan) was used for data analysis. Body composition was determined with bioelectrical impedance analysis (BIA) (ITO-InBody 370: InBody Japan Co., Ltd., Tokyo, Japan) [21, 22]; the values of body weight, BMI, basal metabolism standard value, body-fat percentage, and visceral-fat level were used for analysis. The subject had decreased masticatory function due to loss of the right lower first and second molar teeth (Eichner classification B1) and persistent chronic inflammation due to moderate periodontitis, which could cause an aggravation of NCDs (Fig. 2a). The lost molar teeth were restored with dental implants according to conventional procedures (Platon Japan Co., Ltd., Tokyo, Japan) (Fig. 2b). The FFQ showed that high GI carbohydrates such as noodles and rice accounted for 66% of the subject’s total calorie intake, while the intake of protein, vitamin A, B1, C, D, calcium, iron, zinc, and dietary fiber was below the required amount . The protein-energy ratio was less than 10%. 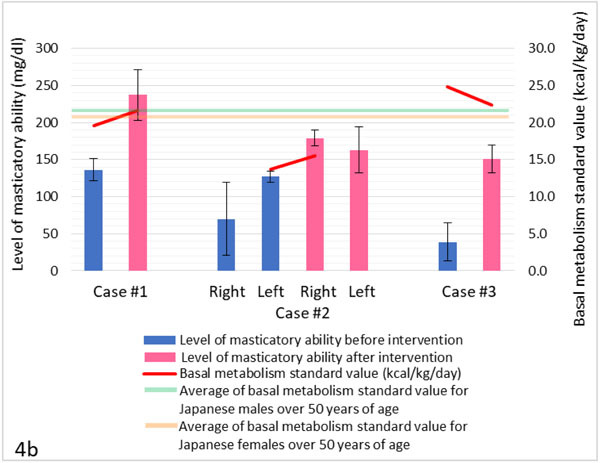 The total quantity of physical activity and exercise was smaller than the normal standard of activity for Japanese males over 65 years of age . Teeth from 3 to 6 in the upper right quadrant and 5 to 7 in the lower left quadrant were missing (Eichner classification B3) (Fig. 3a). The subject complained of pain caused by the partial dentures she was wearing. She experienced difficulty and stress during mastication. We conducted periodontal treatment to control chronic inflammation and restored masticatory function with dental implants (Platon Japan Co., Ltd., Tokyo, Japan) according to conventional procedures (Fig. 3b). Fig. (2a). Panoramic radiograph before prosthodontic treatment (Case 1). Fig. (2b). Panoramic radiograph after prosthodontic treatment. (Case 1). Fig. (3a). Intraoral images and panoramic radiograph before prosthodontic treatment (Case 2). Fig. (3b). 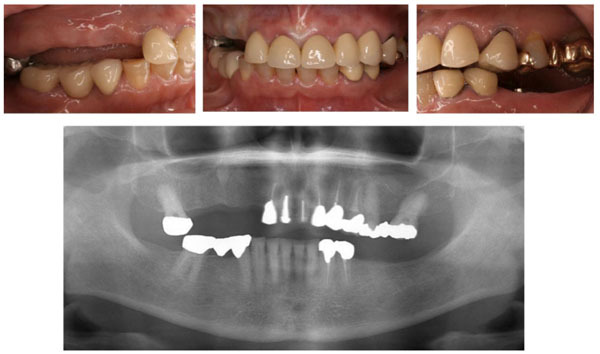 Intraoral images and panoramic radiograph after prosthodontic treatment (Case 2). Table 2. Contents of the health guidance program. Table 3a. General condition before intervention - eating habits and lifestyle (Case 1). Table 3b. Body composition and metabolic parameters before and after prosthodontic intervention and health guidance (Case 1). Table 4a. General condition before intervention - eating habits and lifestyle (Case 2). Table 4b. Body composition and metabolic parameters before and after prosthodontic intervention and health guidance (Case 2). In this case report, the masticatory function of all subjects improved with dental prosthodontic treatment (Figs. 4a-4d). Due to prosthodontic treatment and health guidance, improvements were also confirmed in a wide range of items, including body composition (Fig. 4a), metabolism (Figs. 4b-4c), and nutrient sufficient rates (Fig. 4d). These findings suggest a correlation between masticatory dysfunction, PEM, and an increase in glycemic load, as well as a correlation among masticatory dysfunction , PEM, and decrease in muscle mass (Figs. 4a-4d). The main objective of orthodontic and prosthodontic treatment as well as the treatment of temporomandibular disorders has been esthetic improvement and recovery of masticatory function. Moreover, it has been reported that patient satisfaction greatly increases with expansion of the therapeutic effect; this may include an improvement in general health condition, the short-term disappearance of inflammatory response, a shortened treatment period, an improvement in quality of life, better aesthetic results, as well as an improvement in body composition and metabolism [6, 7, 25]. Table 5a. General condition before intervention - eating habits and lifestyle (Case 3). Table 5b. Body composition and metabolic parameters before and after prosthodontic intervention and health guidance (Case 3). Fig. (4a). 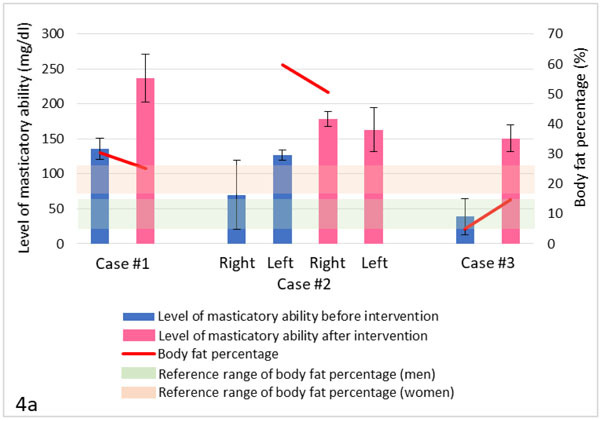 Relationship between the level of masticatory ability and body-fat percentage before and after intervention in each subject. Fig. (4b). Relationship between the level of masticatory ability and basal metabolism standard value before and after intervention in each subject. Fig. (4c). 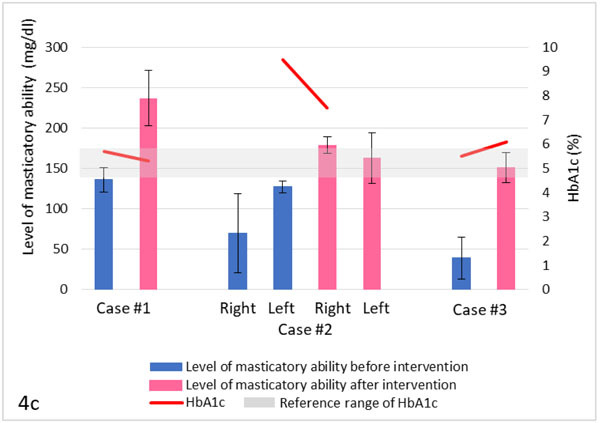 Relationship between the level of masticatory ability and Hemoglobin A1c before and after intervention in each subject. Fig. (4d). 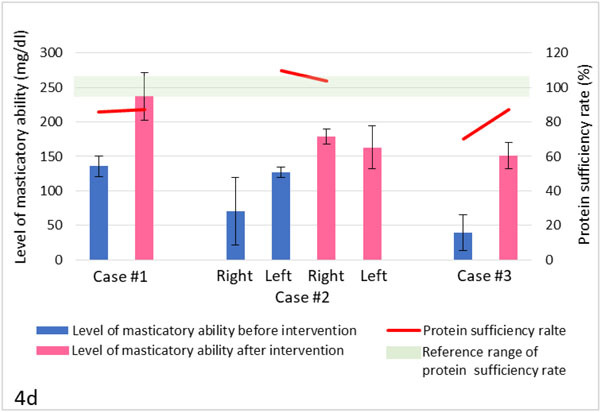 Relationship between the level of masticatory ability and protein sufficiency rate before and after intervention in each subject. Bhupathiraju SN, Tobias DK, Malik VS, et al. Glycemic index, glycemic load, and risk of type 2 diabetes: results from 3 large US cohorts and an updated meta-analysis. Am J Clin Nutr 2014; 100(1): 218-32. Chiu CJ, Taylor A. Dietary hyperglycemia, glycemic index and metabolic retinal diseases. Prog Retin Eye Res 2011; 30(1): 18-53. Wakai K, Naito M, Naito T, et al. Tooth loss and intakes of nutrients and foods: a nationwide survey of Japanese dentists. Community Dent Oral Epidemiol 2010; 38(1): 43-9. Yoshihara A, Watanabe R, Nishimuta M, Hanada N, Miyazaki H. The relationship between dietary intake and the number of teeth in elderly Japanese subjects. Gerodontology 2005; 22(4): 211-8. Isola G, Perillo L, Migliorati M, et al. The impact of temporomandibular joint arthritis on functional disability and global health in patients with juvenile idiopathic arthritis. Eur J Orthod 2018; 1-8. 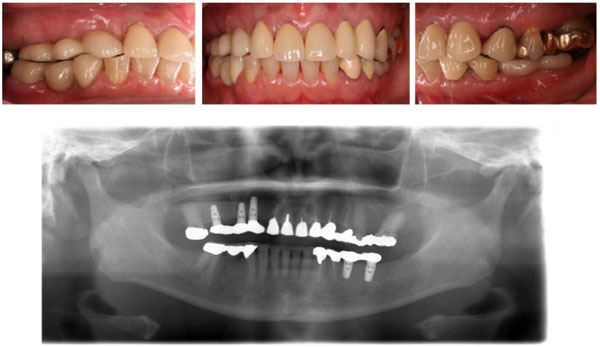 Isola G, Matarese G, Cordasco G, Perillo L, Ramaglia L. Mechano- biology of the tooth movement during the orthodontic treatment: a literature review. Minerva Stomatol 2016; 65(5): 299-327. Zhu Y, Hollis JH. Tooth loss and its association with dietary intake and diet quality in American adults. J Dent 2014; 42(11): 1428-35. Yoshida M, Kikutani T, Yoshikawa M, Tsuga K, Kimura M, Akagawa Y. 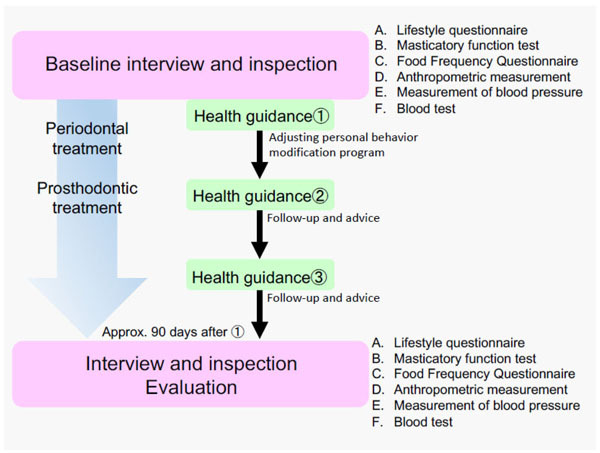 Correlation between dental and nutritional status in community-dwelling elderly Japanese. Geriatr Gerontol Int 2011; 11(3): 315-9. Papas AS, Joshi A, Giunta JL, Palmer CA. Relationships among education, dentate status, and diet in adults. Spec Care Dentist 1998; 18(1): 26-32. Iwasaki M, Kimura Y, Ogawa H, et al. The association between dentition status and sarcopenia in Japanese adults aged ≥75 years. J Oral Rehabil 2017; 44(1): 51-8. Chiu CJ, Liu S, Willett WC, et al. Informing food choices and health outcomes by use of the dietary glycemic index. Nutr Rev 2011; 69(4): 231-42. Schulze MB, Liu S, Rimm EB, Manson JE, Willett WC, Hu FB. Glycemic index, glycemic load, and dietary fiber intake and incidence of type 2 diabetes in younger and middle-aged women. Am J Clin Nutr 2004; 80(2): 348-56. Bradbury J, Thomason JM, Jepson NJ, Walls AW, Allen PF, Moynihan PJ. Nutrition counseling increases fruit and vegetable intake in the edentulous. J Dent Res 2006; 85(5): 463-8. Fushiki T. Why fat is so preferable: from oral fat detection to inducing reward in the brain. Biosci Biotechnol Biochem 2014; 78(3): 363-9. Mizushige T, Inoue K, Fushiki T. Why is fat so tasty? Chemical reception of fatty acid on the tongue. J Nutr Sci Vitaminol (Tokyo) 2007; 53(1): 1-4. Ferro KJ, Ed. The glossary of prosthodontic terms. 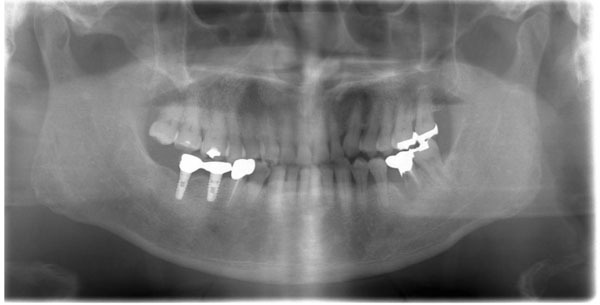 J Prosthet Dent 2005; 94(1): 10-92. Shiga H, Ishikawa A, Nakajima K, Tanaka A. Relationship between masticatory performance using a gummy jelly and food intake ability in Japanese complete denture wearers. Odontology 2015; 103(3): 356-9. Ling CH, de Craen AJ, Slagboom PE, et al. Accuracy of direct segmental multi-frequency bioimpedance analysis in the assessment of total body and segmental body composition in middle-aged adult population. Clin Nutr 2011; 30(5): 610-5. Shafer KJ, Siders WA, Johnson LK, Lukaski HC. Validity of segmental multiple-frequency bioelectrical impedance analysis to estimate body composition of adults across a range of body mass indexes. Nutrition 2009; 25(1): 25-32. Yoshimatsu H. Behavioral therapy for obesity. Nihon Rinsho 2009; 67(2): 373-83.